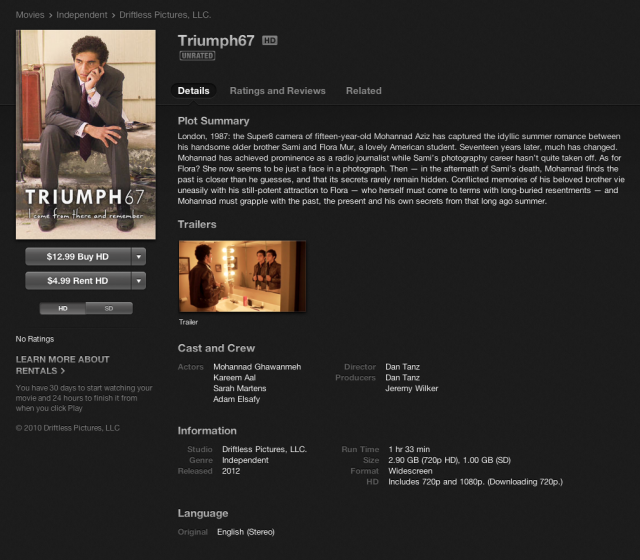 Driftless Pictures is proud to announce that online streaming and downloading of the feature Arab-American film TRIUMPH67 is now available on iTunes, Reelhouse and directly on the official TRIUMPH67 website worldwide. On iTunes, TRIUMPH67 is available in North America as well as 30 other countries, including Bulgaria, Canada, Czech Republic, Cyprus, Denmark, Estonia, Finland, France, Germany, Greece, Hungary, Ireland, Italy, Japan, Latvia, Lithuania, Luxembourg, Malta, Netherlands, New Zealand, Norway, Poland, Portugal, Romania, Slovakia, Slovenia, Spain, Sweden, Switzerland, United Kingdom. This is an English-language version for streaming or downloading. On the official site and via Reelhouse, TRIUMPH67 is available, with extra content, for downloading and streaming worldwide. This is also English-language, with Arabic and French subtitles available as an option. The bonus content is much of what you will find on the DVD extras, but available as part of the VOD package, including commentary, TV interviews, and vignettes with lead actor Mohannad Ghawanmeh. The TRIUMPH67 DVD features these extras, as well as the Arabic and French subtitles, and is region-free for worldwide viewing. A limited release BluRay is also available. Visit the official site at http://www.triumph67film.com/ for more information or to request a screening in your area.